Many news stories have been written about how much money teachers spend out of pocket each year on classroom supplies. But sometimes a picture is worth a thousand words. 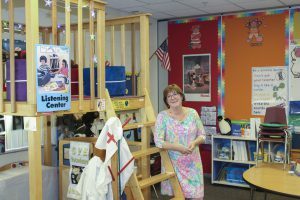 After 32 years as an educator—almost all as a kindergarten teacher in Chippewa Valley—Carolann Jimison retired last month. First she had to clear out her room, and the contrast between before and after the cleanout (pictured in inset, right) reveals what love and dedication and imagination look like in action. Jimison says she was born to teach kindergarten, a position that many elementary teachers shy away from. The children often start the year nervous and unsure. Some know letters and numbers, while others have never touched a book. They must be taught everything about school. “I love how enthusiastic they are and how much they learn and grow in one year,” Jimison said. Her room was filled with bins of learning materials and hanging sleeves with math and literacy challenges, a wall of handmade word magnets, shelves stuffed with books and more books, scarves and puppets, stuffed animals and dress-up clothes. She supplied it all. Her husband is a woodworker she convinced to help her with a classroom need on their first date 30 years ago. “I knew if he was willing to make a bookshelf for me, he was a keeper,” she said. He later built a loft for students to climb up and listen to audio books in cushy seats with stuffed animals, or go underneath to act out stories in dress-up clothes hanging from a coat rack nearby. Learning wasn’t a silent desk activity in Jimison’s classroom—it involved choice and movement and fun for her 26 students. New mandates from the state, or directives from her district, were adapted to fit her philosophy. She knew nothing works the same way for every student.